Dinner time is tough at our house. Bewitching hours? Definitely hit with the little one. And the older two? Want to help out with every detail at dinner and ask a ton of questions. We’ve definitely been in need of some indoor entertainment for when the weather isn’t nice or they can’t be supervised outside. What better way to achieve that than indoor doorway swing? We found this in a Gorilla Gym Swing which has been a great addition to our house and equipment setup. Check out this great deal! Save 10% on your purchase! Yes. We now have a door frame swing hanging in our kitchen! It’s perfect for our family. In fact, the entire Gorilla playground would make a great set; it has the Gorilla Gym, an indoor kids swing, plastic rings, and a climbing ladder; basically, an entire Indoor Gym. That is a lot of indoor fun to have in a small space. And your kids (and the adults) will definitely find it with the Gorilla Gym aka Gym1. The Gorilla Gym is best for kids with all of the accessories. Buy the whole set and you are ready for all of the indoor fun. The kid swing is a by far the favorite part for our kids. From ages 9 all the way down to 3, there were all different types and sizes of people on the swing. The ability to adjust the height makes it work for all different ages and sizes. It is very easy to adjust the height off the floor, too. So for our littlest one, we can have her where her feet completely touch the ground and she’s just experimenting with the swinging motion. For the bigger kids, in a couple seconds, we can take the height higher and they can get a good swing going. We don’t let them swing too high in the house, but it’s high enough that they have fun and enjoy it. We also make sure to test everything out before the girls get on to make sure nothing has changed and it is still safe for them to swing and hang. Equals smiles, and happy girls all around. Which means, happy mommy! I posted this first picture on Instagram and so many people wanted to know the who, whats and wheres. The Gorilla Gym is best for kids with all of the accessories, but if you are just looking for the swing, you can buy the gym bar and the swing. We’ve been testing out the Gorilla Gym aka Gym1 and it’s a big hit with all three girls (and even daddy). I even tested out the swing, too and thought it was really cool. The Gorilla Gym turns almost every doorway into an indoor playground and gym with a favorite being the indoor swing for kids. It’s great for parents trying to entertain their kids inside as well as adults that don’t want to spend the time or money at the gym. While the doorway swing was definitely a favorite for the girls, the older two have taken to doing pull-ups, too. The oldest can do at least 4 in a row. I am now at the point where I can do two in a row, but it’s definitely a challenge for me. And, seeing it there as a reminder has me trying and testing myself daily to see if I can do more. Not only does it help with the girls being able to do something different in the house, but it also helps with a couple lessons. They have had lessons in patience and taking turns as well as helping each other out with gentle pushing if they aren’t quite able to swing themselves. Plus, it’s a way for the girls to practice their swinging inside the house while I’m trying to get dinner ready or tend to other children. Once we pulled it out and read the directions, it took no time at all (maybe a few minutes the first time just getting familiar with it) to put it in our doorway. And it required no tools or holes drilled. The frame is made of steel and weighs only 8 pounds and is very easy to lift and install. What’s even more amazing is that it is strong enough to support even a swinging motorcycle with a rider on it (It has been tested and certified that the main frame and all attachments can support up to 300 lbs according to the ASTM International safety standards! (Admittedly, I was still quite hesitant when I sat on the seat and let myself dangle there for a minute). The only downfall is that we don’t really have a doorway that we can put this up that is out of the way of traffic…or Mr. Serious walking around. He’s 6’3” and has to duck down to avoid hitting his head. And, we have to set the gym swing on top of the main gym part when not in use. But really, it’s a small sacrifice for how much everybody is enjoying it. This makes a great addition to a closet doorway or the doorway to a playroom or dining room that might be out of the way of taller family members and is idea for doorways that aren’t heavily trafficked. Will the Gorilla Gym Fit? Door frame opening of 25-36″ with a minimum of 39″ space around the door frame. Door way trim must stick out at least 1/4″ with a minimum of 2.5″ spacing between the frame and the ceiling. As a Gorilla Gym Core unit for pull-ups. As swing gym with an indoor swing for kids. If there is one part to add on to the Gorilla Gym, this is the one to add. As a rope ladder for climbing to your heart’s content. 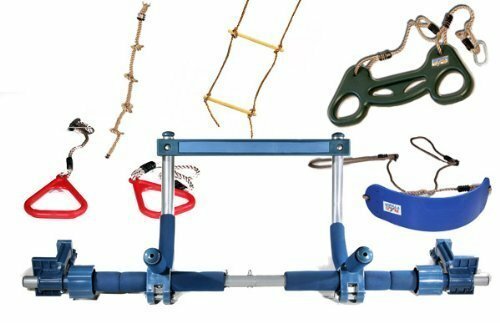 As a ring system for hanging, exercising or a Gorilla Swing. Children with special needs benefit from this setup as well. The kids indoor swing can help children with balance and coordination as he or she uses both the swing and other attachments. I’ve read that balance and swinging can help with early childhood development including balance, speech and coordination. When I was teaching at a high school, there was actually a very similar indoor swing for kids setup in the special needs classroom. I don’t think I passed by the room a single time when there wasn’t a child using it. Sometimes a fussy baby enjoys a soothing ride in a swing. But, you might not want to put them in a baby swing, or you might not have the place for it. With this indoor doorway swing, mom or another adult can sit in the swing holding her baby and gently swing back and forth helping to soothe baby. It’s also nice that it’s in the kitchen for us so mom can have a seat on the swing while trying to prepare a meal and help to soothe a fussy baby. In addition to the swing, you can purchase multiple plug & play attachments: fitness, boxing, and yoga as well as 7 different children’s play attachments: 3 different types of swings for all ages, a trapeze, climbing rope, ladder, and rings. The Gorilla Gym aka Gym1 attachments can be purchased separately (starting at $59) or the entire Indoor Playground with all children’s fun attachments is under $150. All of the attachments are plug and play and require no tools or parts to install them. They are very easy to add to the Gorilla Gym with great ease. You can make it an inside jungle gym with very little effort. yoga swing: Made of 3 pieces: one for your body and then two pieces for your arms or legs: 6 total grip positions. air straps + DVD: Incorporates suspension training, which is one of the most effective workouts available. Gorilla Gym brings the fun of the outdoors inside. It is designed for busy parents and active kids who can’t always make it outdoors and don’t have a lot of room for expensive fun and exercise equipment. Gorilla Gym is lightweight, portable, and installs in your doorway in seconds without tools or drilling. Our patent-pending vise-grips and special stabilizers keep the Gorilla Gym firmly in place so your kids can play safely all day. Safely supporting over 300 pounds and certified to relevant ASTM safety standards, kids can swing, climb and use all 5 of our easy plug and play attachments. Gorilla Gym is so strong that even mom and dad can safely swing, climb, and play all day too! Give them a monkey gym kids love. Purchase the Gorilla Gym on Amazon and most of them ship for free with Prime. *We were sent a Gorilla Gym to test out. No compensation was received. All thoughts are my own. We also have tried out the Playaway Toy which is a another great option for swinging and playing indoors. Check out our Playaway Toy Review. This is really cool. I love that it can hold bigger kids too. I’ve seen an indoor/outdoor swing before, but it’s baby/toddler only. This would be a lot of fun in our basement for the winter! That is an awesome product!! So cool. Looks like your babies are really enjoying themselves. I think I would be on it more than my kids. Okay, that is pretty much the coolest thing I’ve ever seen when it comes to being productive in the kitchen! LOL! What a great way to keep the kids entertained! lol, looks like they might want to help less and play more now!!! That looks like a ton of fun. I could get my big kids and papa bear to work out on it. and my girls would want to swing.. Love that it supports them. Thanks for sharing. oh my gosh my kids would FLIP OUT!! i am going to check it out more- i need to see how they work with arched doorways. how COOL! I have never seen this before, but love the idea of an indoor swing! What a neat idea! This is perfect for rainy days when you can’t let them burn off energy at the playground. What a great way to get out some of that energy indoors! I’d want to play, too! How fun! My soon would love this so much! Now that’s what I need. I would for sure do that!! I love when I stretched my arms by hanging on something!!! I love that this comes with children’s attachments too. Lucas is always getting into my exercise equipment but it’s really not safe since they are made for adults. Now that looks like fun for a kid! I remember having some swing at my Nana’s when I was little and thought it was the best! Great way to get exercise in the cold months and to get some of those wiggles out!!! I like this idea a lot. You’ve got some tough cookie girls there! Love it! So glad you found something he loves! It’s such a fun gift!